Channel notifications can be managed from within the Channel, User Settings or from Notification centre. The easiest way is to open the Channel and from the right panel toggle notification settings open and select the notification priority you want. You will be notified whenever anything happens in the Channel. You will be notified whenever you something you have posted or commented on receives a like or comment. You will also be notified when someone @mentions you. 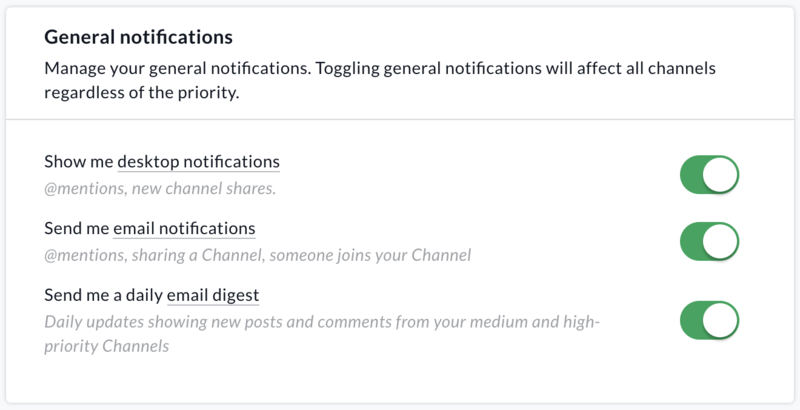 Managing notifications from Channel settings will allow you to manage one specific Channels notification settings. To manage all Notifications you will need to access Notifications in User Settings under your avatar or through the Notifications centre. From User Settings you are able to not only update your Channel notification settings but also choose your general notification settings. This will enable or disable desktop notifications when you are @mentioned or a new channel is shared with you. Note if desktop notifications are turned off on your browser the desktop notifications toggle will look like this. In this case you will need to turn this on browser notifications first and the information can be found here. This will enable or disable email notifications from Happeo. This will be on by default but can be updated at any time. If you are receiving too many email notifications first review you Channel notification settings to make sure they are correct. This will enable or disable a daily email containing all updates from the day based on your Channel notification settings. Accessing Notifications from the Notifications settings will take you to the Notifications tab under User Settings.